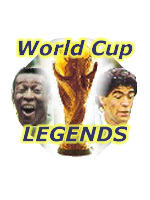 It was Luigi Riva's seven goals in the qualification tournament which took Italy to the 1970 World Cup. Born at Leggiuno in November 1944, he began with Legnano in Serie C in 1962/63, joined Cagliari in 1963/64 and helped them into Serie A. Riva made his international debut as a substitute in Budapest in June 1965, but was inexplicably left out of the 1966 World Cup squad. He became established in 1967, then suffered a broken leg, but was soon back in action and finished as the league's top scorer. Originally a left winger, his deadly left foot combined with speed and courage to make him one of Italy's top strikers and best-loved players. In 1969/70 he helped Cagliari to their first Italian title and was the Italian league's top scorer for the third time in four seasons. 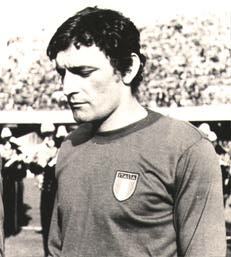 Italy's topscorer in the 1970 World Cup in Mexico, he netted the crucial extra-time goal - his 22nd in 21 internationals - against West Germany in the semifinal. Soon afterwards, Riva again broke a leg, in a European Championship qualifier against Austria. He turned down a £1.500.000 move to Juventus in 1973, at the age of 29, but had a bad 1974 World Cup and was dropped for the last game against Poland. After retiring he became an executive with Cagliari.